Simmons® Beds and Mattresses – Sleep better and feel better on one of Simmons® mattresses. OVER 140 YEARS OF RELENTLESS INNOVATION. Simmons has a history of revolutionizing sleep technology and giving you the sleep you deserve. 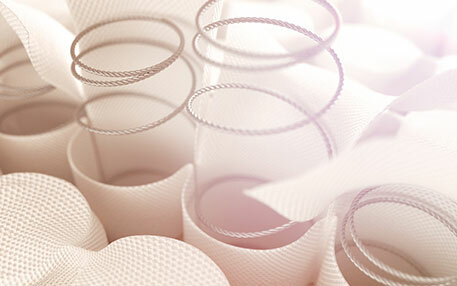 When the first wrapped coil spring was patented back in 1900, it sparked an idea at Simmons. Instead of building these coils by hand—a slow manual process—what if we could develop a machine to do it better and faster? That’s exactly what our top engineer did—and the Simmons Pocketed Coil spring machine was born, paving the way for our signature Beautyrest mattress in 1925. We were the first mattress company to introduce a king and queen size mattress in the 1950s, and in 2008 we invented a hybrid technology that fused memory foam and Pocketed Coil, leaving the rest of the industry scrambling to follow. For us, it’s always been about innovating relentlessly—so you can get the rest you deserve.